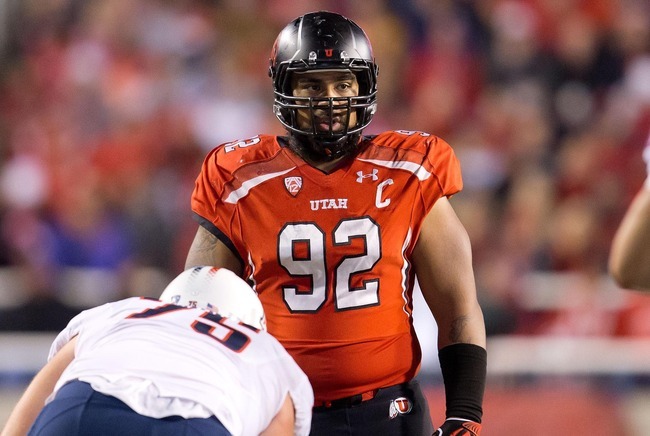 Utah DT Star Lotulelei makes a convincing case to be selected in the top 10 picks of the upcoming draft. Utah’s Star Lotulelei established himself as one of college football’s marquee pro prospects after an outstanding 2011 season. He remained an elite prospect in most analysts’ eyes after a rock solid 2012 campaign, but at the NFL Combine in February, doctors discovered a worrisome heart malfunction. His stock began to slide, but is now on the mend since Lotulelei has passed exhaustive medical tests clearing him for all football activities. However, he was unable to participate in the Combine drills due to the heart concern, so some questions about his athleticism and quickness could persist in many draft rooms. Because of this uncertainty, Lotulelei could be drafted anywhere from 3rd overall (Raiders) to the 14th pick (Panthers). The Eagles reportedly like Lotulelei a lot, and he is a definite possibility for Howie Roseman in the first round. Lotulelei plays with remarkable natural power and never goes backwards. He faces double teams constantly, but holds up well throughout the game. He looks to occupy double teams instead of splitting them, making him a good fit for a 2-gap system. Tries to go through blockers rather than around them, and although he does not shoot gaps well, he can drive an offensive lineman several yards into the backfield one-on-one. Doesn’t give up ground North-South, but can get washed out of plays East-West. Doesn’t flow to the football well. Inconsistent effort chasing plays from the backside. Usually not a factor on outside runs, although he has enough lateral agility to string plays out. Could be dominant in the NFL, where he figures to garner less attention from opposing offenses. Lotulelei does not display the motor or quickness to be a great pass rusher. However, he has the skills to be a 3 down player. Shows great awareness to recognize screen passes. Gets his hands up and bats down passes at the line of scrimmage. He has developed polished rip and swim moves. Is a great bull rusher when he gets under opponent’s pads, but consistent leverage is a big issue. Loves to hit the QB. Isn’t always relentless and doesn’t always look to chase QBs who roll outside the pocket. Athletic enough to run twists and stunts up front. At 6’3″, 311, Lotulelei has awesome natural power and uses his strong, heavy hands to his advantage. He has some quickness, but it doesn’t usually show up on tape because he doesn’t look to penetrate into the backfield or get by blockers. Long speed is certainly adequate, as he has the ability to chase plays to the sidelines when willing. Has excellent build and is versatile enough to play 3-4 end, 4-3 tackle, or 3-4 nose. Will be 24 in December. Battled weight issues earlier in his college career, but has shown commitment to improving diet and has seen results. Already has a family, and coaches reportedly love his work ethic and maturity. Has been very durable over the course of his career, but teams will have to be comfortable with his heart scare from the Combine. Lotulelei has a knack for blocking field goals and batting passes down at the line. At Utah, he played a tremendous amount of snaps and faced nearly constant double teams. He did not appear to wear down over the course of games, but certainly picked his spots in the hustle category. A healthier snap count in the NFL could improve his motor. The Eagles’ new defensive system is still a sort of secret, but Lotulelei fits into any defensive front. His favorite position is nose tackle, but he would likely play DE across from Fletcher Cox with the Eagles. He can play anywhere along an even (3 down defensive lineman) front. The Eagles also need another defensive lineman to join Cox, Isaac Sopoaga, and Cedric Thornton. Lotulelei fits in Philadelphia both from a schematic perspective and because he fills a need on the roster. The question is whether or not he is a top 5 talent. I love his natural power, but I would have liked to see more pass rush skills out of a potential top 5 pick. Lotulelei does a lot of things really well, but he’s not an All-Pro caliber player, either. If the Eagles are content in getting a rock solid starter at 4, Lotulelei’s their man. They will know what they are getting with him, but upside is somewhat limited (although he could be a very, very good player). On the other hand, if the Eagles expect Lotulelei to be a franchise-changing pick, they will probably be disappointed. I view Lotulelei as a borderline top 10 talent, but he would still be a good pick.